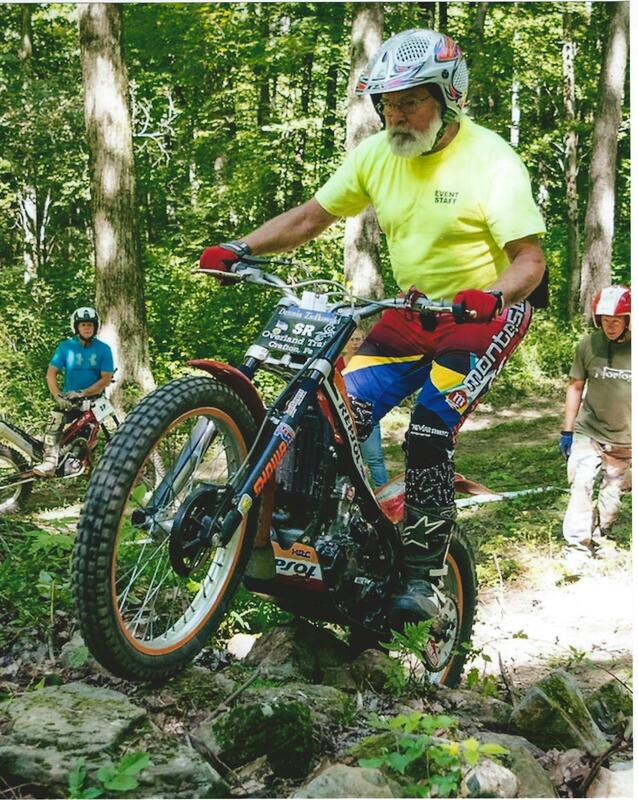 Dennis started competing in offroad motorcycle competition in 1964 when he competed in an Enduro at Salem Ohio on a 1964 250 Honda Scrambler. He rode Enduros for about 10 years. In 1970 he formed an offroad Motorcycle Club called Overland Trail Riders M/c that promoted Hare Scrambles and Observed Trials. During this time we were a venue for the Trials Inc riders. The club continued growing the sport of offroad riding for 10 years. In 1975 he was one of the founding fathers of American Motorcycle Association (AMA) District 5 which promoted all forms of motorcycle competition for the western ½ of Pennsylvania and all of West Virginia. He was president of this organization for 10 years as well as an AMA congressman for 6 years and was a member of the offroad committee. From the start of his offroad riding he competed in many event types like Hare Scrambles, Hill Climbs and flat track. By the mid 70’s he started focusing his riding on Observed Trials competition. He won his first class championship in the Junior class in 1978. Because of work he was not able to compete on a regular basis but did manage a winning year in 1996, 1998, and 2006. From 2009 thru 2013 he was the Senior class champion, he was 70 years old when he won in 2013. In addition to the other motorcycle affiliations mentioned above he has been a member of Trials Inc organization from 1975 thru today. In 1980 he was VP of the organization and held other duties like Area Rep for Tippecanoe in the mid 2000’s. He was also instrumental in establishing the West Virginia chapter that saw its first event in 2011 at Joe’s Mountain and another 4 years at Grafton. Over the years he has worked many of the nationals (NATC), from course layout and grooming, section layout and marking, to Puncher, Checker, Tech Inspection, Pit management, and asst. Trials Master. Not sure how many of the NATC events he was involved with but considering he participated in most, if not all, the Trials Inc events starting in the early ‘80s in Ripley NY to the most recent in 2017 at Southington. One can only guess there was at least 10. He also checked a couple Nationals in New York and quite a few in Eastern PA. He also worked a World Round in New York as well as Tennessee. Lastly he was part of the team that put together the AMA Vintage Trials events at Mid-Ohio from 2009 thru 2014, this event continues today and is run by many Trials Inc members. The other was being recognized by AMA with his Letter of the Month titled “30 years of riding”. The article included two pictures of him and his two sons. The first in 1979 when they were on 1975 TY- 80 trials bikes. The second was in 2009 when they rode Montesa in the Fun in the Sun event in Florida.